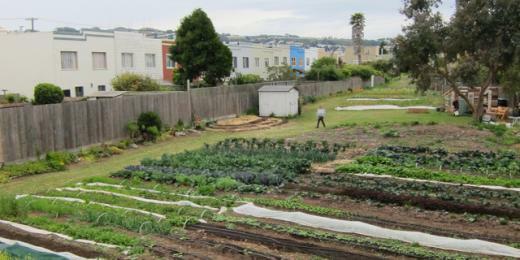 Little City Gardens, pictured above, is one urban agriculture project in San Francisco hoping to take advantage of the new law. Photo courtesy of Little City Gardens. California’s cities will have a new policy tool to support urban agriculture thanks to state legislation that Governor Jerry Brown signed into law on September 28. The Urban Agriculture Incentive Zones Act (Assembly Bill 551) — introduced by Assembly Member Phil Ting, supported by more than 25 organizations across the state and passed by bi-partisan majorities in both the California Assembly and Senate — will take effect on January 1, 2014. SPUR was a strong supporter of this legislation and helped lead the coalition of groups advocating for its passage in Sacramento. The bill aims to accomplish two things: increased use of privately owned, vacant land for urban agriculture and improved land security for urban agriculture projects. The legislation does this by allowing city governments, with approval from their county board of supervisors, to designate areas within their boundaries as “urban agriculture incentive zones.” In these areas, landowners who sign a contract to commit their land to agricultural use for at least five years will get a reduction in their property taxes. Specifically, their parcel’s property tax assessment will be based on the agricultural value of the land rather than the market-rate value of the land. – Each year the assessment basis of land under contract will be based on the average per acre value of irrigated cropland in California as reported by the US Department of Agriculture’s National Agricultural Statistics Service. In 2012, this was $12,000 per acre. – If a landowner breaks the five-year contract, they are obligated to pay back the tax benefit that they received. The new law enables cities and counties to take action, but it does not create any urban agriculture incentive zones itself. Instead, cities and counties must go through the process of passing ordinances and resolutions creating zones within their jurisdictions. Once those are established, landowners can begin signing contracts with the cities and then begin to see the property-tax benefit. Advocates and elected officials in San Francisco, Los Angeles and Sacramento have all expressed an interest in creating urban agriculture incentive zones in their respective cities. In the coming months, legislation will likely be introduced in one or more of these cities that translates the change in state law into on-the-ground results. It is then that we will see how many contracts are signed and how well the legislation helps urban agriculture projects secure access to land and longer land tenure.